Very Happy New Year 2019!!! At Town & Country Animal Clinic/ Services, we understand how much quality health care for your animals mean to you. Pet owners, livestock producers, horse trainers and breeders in Danville and surrounding counties rely on us as a professional and welcoming home for the care of their animals. Dr. Jack Jones opened Town & Country Animal Clinic in 2009 to treat companion animals in and around Boyle County. 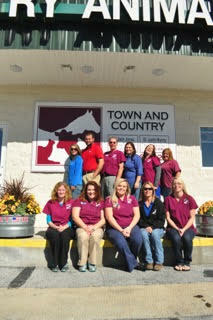 Dr. Justin Murray joined in 2011 with Town & Country Animal Services, providing clients with ambulatory large animal care. Over the years, the hospital has expanded into a full-service facility with a highly qualified veterinary team who use state-of- the-art technology and medicine to deliver the best veterinary care to your dogs, cats, and horses and farm animals. We offer comprehensive in-house diagnostic services, internal medicine, surgery, reproductive services for horses, herd health services for cattle and other large animals. Boarding and grooming are available for dogs and cats. 859-236-6020 to schedule an appointment. We look forward to meeting you!